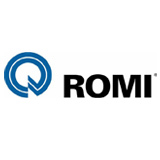 ​Romi have designed and manufactured machine tools for over 80 years . With a complete product range of over 140 machines, Romi offers an excellent range at competitive prices to many manufacturing sectors including aerospace, automotive, oil & gas, medical and general sub-contract engineering. Romi offer a wide choice of precision manual/teach CNC lathes, high volume production turning centres and vertical machining centres.